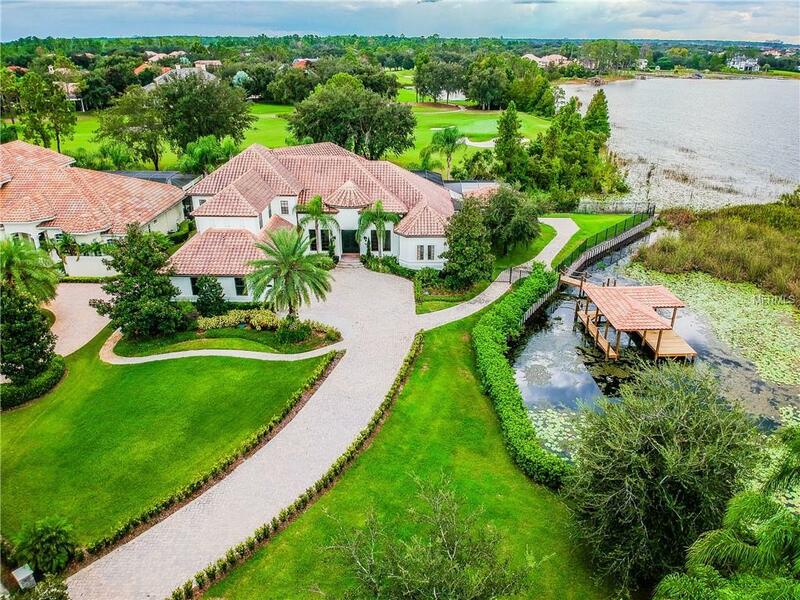 ONE OF A KIND LAKE AND GOLF FRONT CUSTOM HOME built by Osprey custom homes perfectly suited to enjoy the beautiful views of Jack Nicklaus Golf Course at Golden Bear with breathtaking water vistas. Nestled on the shore of Lake Burden in Keene's Pointe, Windermere's upscale private gated community. This Model Quality, Mediterranean flavored home expresses clean lines which have been professionally decorated to enhance the quality of this wonderful home. The home was designed to capture the sweeping views afforded by the natural beauty of the land, with 6 bedrooms (4 ensuites), 9 full baths, 1 half baths, oversized laundry, mud room, library with custom built-ins, chiseled travertine flooring with the dining room opening to the living room for more formal entertaining. The open kitchen with custom cabinetry, top of the line appliances, professional gas cook-top, built-in oven and warming drawer, microwave, subzero refrigerator, under counter two drawer beverage refrigerators, wine chiller, center isle prep center all overlooking the family room designed with custom book cases. At the top of the staircase youll be welcome by the media room with theater seating, top of the line projection system and its own beverage center, and lets not forget Florida style outdoor entertaining at its finest, including an over-sized lanai, rectangular fire pit, pool & spa and outdoor summer kitchen with breathtaking sunsets, 3 car garage and plenty of upgrades.